Easy to enjoy just like summertime, the Rotating Flip-Back Pedestal Grill is a popular choice for parks throughout the country. Engineered user-friendly, this park grill provides an adjustable, flip-back and rotating cooking grate that offers 280 square inches of grilling space. The grate is constructed with 1/2" steel bars and is crafted with cool coil spring grip handles, which safely allows the grate to be adjusted to 4 pre-configured cooking heights or flipped-back for easy fire building and clean out. The ultra-durable, rust-resistant firebox features 10-gauge steel walls and 7-gauge steel base fabricated with rear drainage holes and rounded corners for optimum safety. 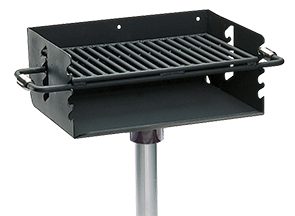 Specifically for in-ground mounted installation, 3-1/2" galvanized steel pedestal post fastened to the firebox so that it allows the grill to rotate 360 degrees for safety and convenience.